The RAGE tournaments the Virtual Gaming League's elite competition where the best gamers in the world compete in a fight to the digital death. Every kill is broadcast to millions. Every player leads a life of ultimate fame, responsible only for entertaining the masses. 1. I am in total awe of the world that Jennings has created. Not only is it completely realistic, it is something that could very well happen in our near future. Virtual Reality gaming is huge right now and I can definitely see our world taking this kind of turn with gaming. 2. I loved how the author left no holes in her plot. She even went as far as explaining how sports athletes failed to work in VRG and I really loved how she changed the face of a gamers. When you think of gamers you probably think overweight, but with Jennings world gamers have to become their character or they won't survive the arena. So cool!! It makes you think that this might truly be a way to overcome those gaming obesity issues. 3. The characters were amazing! I loved Kali and it was intriguing to see her heritage come into the story. I thought that whole storyline was done quite beautifully and I found myself wanting to learn more about Chinese culture. 4. I have to give the author major props for the romance. It was a very slow build and it really fit within the story. I enjoyed getting to know the characters before the were an item and it was nice to see a friendship blossom before anything else. 5. I also thought the way drugs were portrayed in the story was done well. Drugs are and will always be an issue for athletes and I thought the author did a great job showing the darker side of her story. 6. I was very surprised this turned out to be more of a contemporary novel. Yes there is gaming and all this fun futuristic stuff, but at it's core I felt like this was a contemporary novel. And you know what I really enjoyed it. I think this is how I need my contemporary stories. 1. There isn't much that I didn't like about this story. The only thing that really stands out is the ending. I liked all but one part and since it is a spoiler I won't say much. I will just say that I understand why the author chose to have her characters go where they went, I just wish there had been a different path. So not so much as a dislike just a "Aw man". I will say there is a sequel that I am definitely picking up next so hopefully that issue will be resolved. As you can see I really enjoyed this book and I can't wait to dive into the sequel. 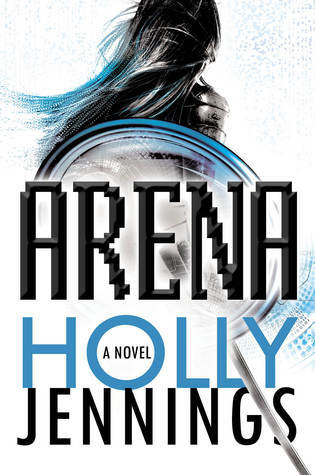 Holly Jennings tells a masterful story that totally captivated me and made me want to plug in for more! I have heard such great things about this + it's diverse so I cannot wait to read this! Great to hear you enjoyed it! The idea of virtual reality gaming tournaments seems a lot like science inevitability more than it does science fiction, which added to the very fun read of Arena. The book wasn't perfect, but my gripes are minor. What matters is I'll definitely be reading the sequel.